Crawford Williamson Long (November 1, 1815 – June 16, 1878) was an American surgeon and pharmacist best known for his first use of inhaled sulfuric ether as an anesthetic. 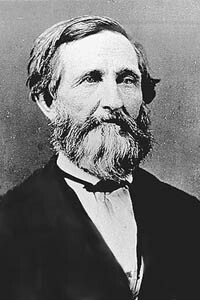 Long was born in Danielsville, Madison County, Georgia on November 1, 1815 to James and Elizabeth Long. His father was a state senator, a merchant and a planter, and named his son after his close friend and colleague, Georgia statesman William H. Crawford. By the age of fourteen he had graduated from the local academy and applied to the University of Georgia in Athens. It was here he met and shared a room with Alexander Stephens, future Vice President of the Confederate States of America during the American Civil War. In 1835, he received his A.M. degree. He began his study at Transylvania College in the fall of 1836 in Lexington, Kentucky. Here, Long was able to study under Benjamin Dudley, a revered surgeon. He observed and participated in many surgeries and noted the effects of operating without anesthesia. Long transferred to the University of Pennsylvania in Philadelphia after spending only a year at Transylvania College, and was exposed to some of the most advanced medical technology of the time. He received his M.D. degree at the University of Pennsylvania in 1839. After an 18-month internship in New York, Long returned to Georgia. He took over a rural medical practice in Jefferson, Jackson County, in 1841. After observing the same physiological effects with diethyl ether ("ether") that Humphry Davy had described for nitrous oxide in 1800, Long used ether for the first time on March 30, 1842, to remove a tumor from the neck of a patient, James M. Venable. He administered sulfuric ether on a towel and simply had the patient inhale. He performed many other surgeries using this technique during the next few years, introducing the technique to his obstetrics practice as well. Long subsequently removed a second tumor from Venable and used ether as an anesthetic in amputations and childbirth. Despite his continued use of the ether anesthetic, Long did not immediately publish his findings. The results of these trials were eventually published in 1849 in The Southern Medical and Surgical Journal. An original copy of this publication is held in the U.S. National Library of Medicine. Crawford Long was a member of the Demosthenian Literary Society while a student at the University of Georgia. Long was also a cousin of the western legend Doc Holliday, and may have operated on Doc's cleft lip. A controversy soon ensued between Messrs. Jackson, Morton and Wells, in regard to who was entitled to the honor of being the discoverer of the anaesthetic powers of ether, and a considerable time elapsed before I was able to ascertain the exact period when their first operations were performed. Ascertaining this fact, through negligence I have now permitted a much longer time to elapse than I designed, or than my professional friends with whom I consulted advised; but as no account has been published, (so far as I have been able to ascertain), of the inhalation of ether being used to prevent pain in surgical operations as early as March, 1842. My friends think I would be doing myself injustice, not to notify my brethren of the medical profession of my priority of the use of ether by inhalation in surgical practice. In 1854, Long requested William Crosby Dawson, a U.S. Senator, to present his claims of ether anesthesia discovery to the attention of Congress. Despite his extensive petitioning and documented proof, he never received full credit for his discovery during his lifetime. Long married Caroline Swain in 1842 and together they had twelve children, seven of whom survived to adulthood. The family moved to Atlanta in 1850, then again to Athens in 1851 to be closer to friends and family. Here, Long and his brother Robert opened a private practice and pharmacy on Broad Street, just across from campus. During the Civil War, he joined a militia unit in Athens, but was never called to duty. Instead he served there as a surgeon to soldiers on both sides. He died of a stroke on June 16, 1878 shortly after helping to deliver a baby. He is buried alongside his wife in Oconee Cemetery in Athens, Georgia. Throughout his professional career, Long was strongly convinced of his calling to serve humanity. He said that his profession was a "ministry from God" and that "his highest ambition was to do good and leave the world better by his labors." Permit me to say then, that a Dentist and a surgeon from Boston, Mass. were in Jefferson Jackson County in 1842, 3 or 4 and remained for several weeks. The dentist practiced his profession & the surgeon operated for strabismus-I have always thought it probable, that the Dentist was Morton or Wells, & that a knowledge of my use of ether in surgical operations was obtained at that time. I have not been able to ascertain the name of the dentist, if you know the history of Dr. Wells, you can possibly asertain (sic) whether he travelled South at the time mentioned." We cannot assign to him any influence upon the historical development of our knowledge of surgical anesthesia or any share in its introduction to the world at large." Standing here in the presence of his remains, I am this day but the voice of the church, of his professional brethren, and of this whole community when I say in Dr. Long's death we have lost an excellent man. He assumed nothing, and was thoroughly truthful in looks, tone, manner and action; lived simply, treated everyone courteously, and walked humbly before God. Modest even to the verge of timidity, he could be stern and bold, and utterly forgetful of self, if responsibility had to be met, or danger confronted. Gentle, forbearing, faithful to every wise instinct, he kept the covenant of a heart's true love until his days were numbered. He had strength of will and power of endurance. The minor heroisms which make up so large a share of a physician's experience, and of which the world knows so little, wrote many a paragraph in the annals of his life. We shall give the manly virtues of Christian integrity of Crawford Long a dwelling place where so many of the elect of our life already gathered." In 1879, the National Eclectic Medical Association declared that Long was the official discoverer of anesthesia. "Doctors Day" is celebrated on March 30 every year to commemorate Long's contributions. The University of Pennsylvania memorialized Crawford W. Long in Philadelphia, Pennsylvania, April 1912, with a bulletin and bronze medallion. On August 14, 1920, the Georgia state legislature proposed a constitutional amendment to create a new county from the western portions of Liberty County, to be named after Long. The amendment creating Long County was ratified on November 2, 1920. The county seat is Ludowici. The Emory-University-operated Crawford W. Long Hospital in downtown Atlanta, Georgia was named in his honor in 1931 and retained that name for 78 years. In 2009 the hospital was renamed "Emory University Hospital Midtown". References to Crawford W. Long Memorial Hospital are retained on exterior monuments. Long was honored in the "Famous American Series" of postage stamps in 1940, and in 1978 with a postcard. The Crawford W. Long Museum in downtown Jefferson, Georgia has been in operation since 1957. A monument in honor of Long was unveiled in Jefferson on April 21, 1910. A statue of Long stands in the crypt of the United States Capitol as one of the two designated monuments to represent the state of Georgia in the National Statuary Hall Collection (the other is his college roommate, Alexander Stephens). Crawford Long Middle School, in Atlanta, Georgia, was also named in his honor. Long's childhood home was added to the National Register of Historic Places on December 6, 1977. It is located on Crawford W. Long St. in Danielsville, Georgia. Its coordinates are 34°07′34″N 83°13′28″W﻿ / ﻿34.12611°N 83.22444°W﻿ / 34.12611; -83.22444. ^ "Crawford Long Birthsite historical marker". Digital Library of Georgia. Retrieved June 1, 2016. ^ Hellmann, Paul T. (May 13, 2013). Historical Gazetteer of the United States. Routledge. p. 227. Retrieved November 30, 2013. ^ "Crawford W. Long." SMA Alliance. N.p., n.d. Web. 02 Mar. 2017. ^ a b c d e f g h i j Madden, M. L.. "Crawford Long (1815–1878)." New Georgia Encyclopedia. 05 August 2015. Web. 28 February 2017. ^ Anaya-Prado, Roberto; Schadegg-Peña, Daniel (2015). "Crawford Williamson Long: The True Pioneer of Surgical Anesthesia". Journal of Investigative Surgery. 28 (4): 181. doi:10.3109/08941939.2015.1061826. ^ Long, CW (1849). "An account of the first use of Sulphuric Ether by Inhalation as an Anaesthetic in Surgical Operations". Southern Medical and Surgical Journal. 5: 705–713. ^ "The first patient to whom Crawford Williamson Long administered s[ulphuric] ether c.1854–1910". National Library of Medicine. ^ Nakayama, Don K. (2016). "Surgical History: Crawford Long, Alfred Blalock, Louis Wright, and Georgia's Surgical Heritage". American Surgeon. 82 (2): 90. Retrieved June 1, 2016. ^ "Crawford W. Long's First Publication concerning His Use of Ether for Anesthesia ..."Crawford W. Long's First Publication concerning His Use of Ether for Anesthesia ... | JLR Medical Group. N.p., n.d. Web. 02 Mar. 2017. ^ Northen, William J.; Graves, John Temple (1910). Men of Mark in Georgia: A Complete and Elaborate History of the State from Its Settlement to the Present Time, Chiefly Told in Biographies and Autobiographies of the Most Eminent Men of Each Period of Georgia's Progress and Development. 2. Atlanta, Georgia: A. B. Caldwell. pp. 131–136. ^ a b "Crawford W. Long". Architect of the Capitol. Retrieved June 1, 2016. ^ a b c d Boland, Frank Kells (2009). The First Anesthetic: The Story of Crawford Long. Athens: University of Georgia Press. p. 121. ISBN 0820334367. Retrieved June 1, 2016. ^ Keys, Thomas (1961). The History of Surgical Anesthesia. Wood Library – Museum of Anesthesiology. ^ Madden, M. L.. "Crawford Long (1815–1878)." New Georgia Encyclopedia. 5 August 2015. Web. 28 February 2017. ^ "Bulletin of memorial to Crawford W. Long, Philadelphia, Pennsylvania, 1912 April". Digital Library of Georgia. Retrieved June 1, 2016. ^ Krakow, Kenneth K. (1975). Georgia Place-Names: Their History and Origins (PDF). Macon, GA: Winship Press. p. 135. ISBN 0-915430-00-2. ^ Goodwin, Sarah (February 16, 2009). "Hospital name change enhances mission" (Press release). Emory University. Retrieved February 13, 2015. ^ "Emory Crawford Long Hospital Renamed Emory University Hospital Midtown" (Press release). Emory Healthcare. February 13, 2009. Archived from the original on February 26, 2009. Retrieved February 13, 2015. ^ Sekhar, K. C. (2013). "A Philatelic History of Anesthesiology". Journal of Anaesthesiology Clinical Pharmacology. 29 (1): 22. doi:10.4103/0970-9185.105788. Retrieved October 5, 2016. ^ Murdock, Eugene J.; Deaver, Susan (1996). "Imagining in time. Documenting the discovery of anesthesia: the Crawford W. Long Museum". AANA Journal. 64 (1): 60. Retrieved August 15, 2016. ^ "Dr. Crawford W. Long Monument. Unveiled at Jefferson, Georgia. April 21, 1910". Historic Postcard Collection, RG 48-2-5. Georgia Archives. Retrieved June 1, 2016. Boland, FK (1950). The first anesthetic: the story of Crawford Long. Athens, Georgia: University of Georgia Press. LCCN 50007365. OCLC 14654575. Crawford, WM (February 1984). "More on the ether operation". NEJM. 310 (8): 534. doi:10.1056/NEJM198402233100824. PMID 6363934. "Crawford W. Long (1815–1878) discoverer of ether for anesthesia". JAMA. 194 (9): 1008–9. 1965. doi:10.1001/jama.194.9.1008. PMID 5321288. Das, Sakti; Nation Earl F. (2004). "Hugh Hampton Young, the anesthesiologist". Urology. 64 (3): 628–30. doi:10.1016/j.urology.2003.10.057. PMID 15351622. Jacobs, Joseph (1919). Some personal recollections and private correspondence of Dr. Crawford Williamson Long, discoverer of anæsthesia with sulphuric ether; together with documentary proofs of his priority in this wonderful discovery. Atlanta: Jos. Jacobs. Retrieved June 1, 2016. Keys, T. E. (1972). "Historical vignettes. Dr. Crawford Williamson Long (1815–1878)". Anesth Analg. 51 (6): 865. doi:10.1213/00000539-197211000-00011. PMID 4564633. Taylor, Frances Long (1928). Crawford W. Long & the Discovery of Ether Anesthesia. New York: Paul B. Hoeber, Inc. OCLC 1848152. "The Crawford W. Long Museum". Retrieved February 18, 2015. "The Discovery of Anaesthesia". Athens Daily Banner. Athens, Georgia. Athens Historic Newspapers Archive. June 16, 1901. Retrieved February 13, 2015. Kelly, Howard A.; Burrage, Walter L., eds. (1920). "Long, Crawford Williamson" . American Medical Biographies . Baltimore: The Norman, Remington Company.